Happy Saturday!! It's that time of the week again---Etsy Inspired post day. And, can I just take the time to say how much I enjoy being a part of this team?! I have met such lovely, kind and talented ladies who work hard every week to come up with beautiful designs, and it's been an honor to be on this team....don't fret, I'm not going anwhere. But, now on to the post. This week's shop is Pegasus Maiden, which specializes in using beautiful ostrich and hen feathers in unique ways. 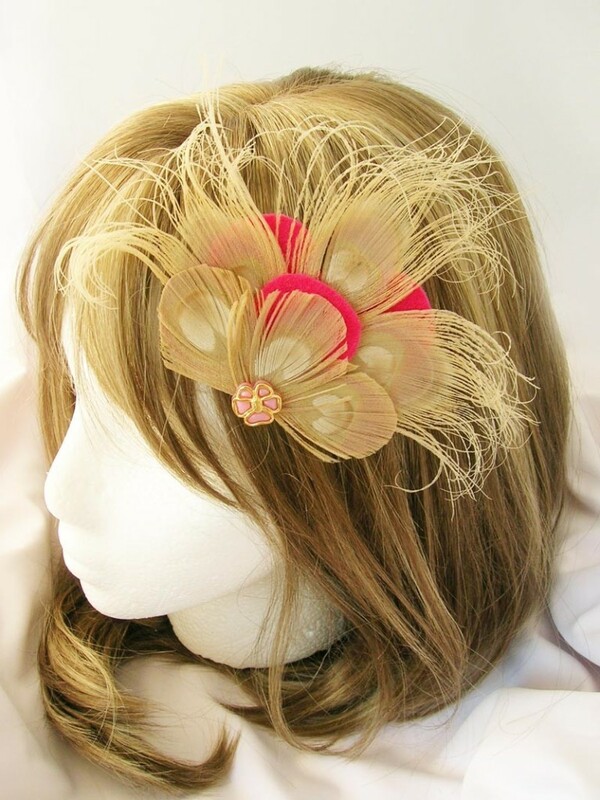 They have a colorful collection of feathers that make up headbands, and hairclips! Here are some examples of my favorites from this shop. I am seriously in love with the designs, if I had had more time this week I would have made a second design using feathers in my design. 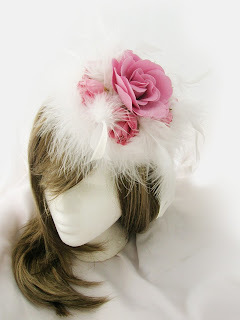 This weekend I think I may buy some feathers to experiment with! But, now onto the piece that inspired me. 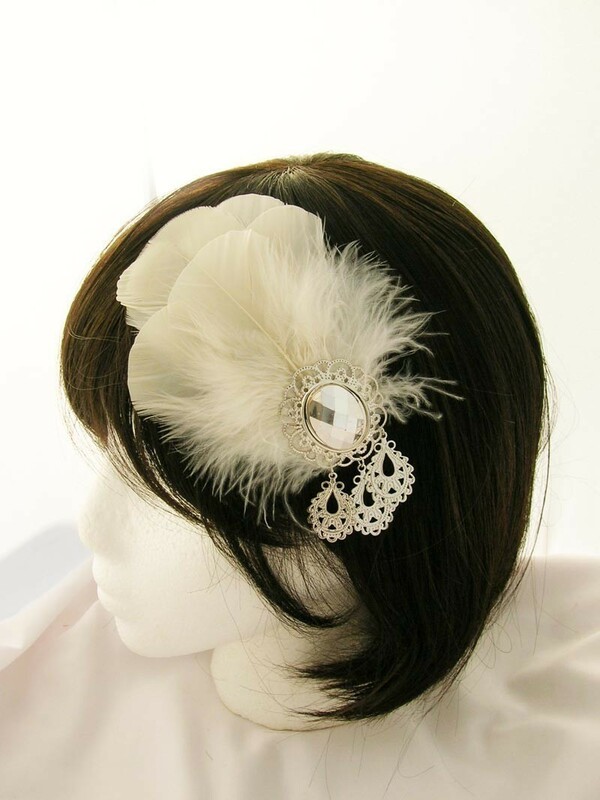 I was inspired by the feathers crafted into butterfly motif! This design totally amazed me! I had never even thought of using feathers in that way! So, I decided to incorporate the butterfly into my design and take the color scheme from the inspiration piece to be the "popping" colors in my design. I thought it would be fun to layer the butterfly dies, with the two-sided paper that coordinates with the inspiration colors on the bottom layer. I think it makes a nice contrast! 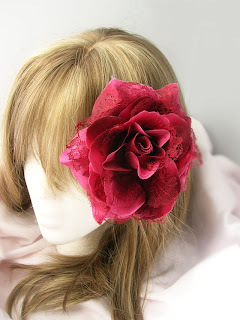 Pegasus Maiden is offering a very fabulous prize to one of the winner's this week, a one-of-a-kind beautiful hairpiece picture here. Such a lovely piece! I'd love to win it! This week our sponsor is Schlosser Designs. They're a fabulous store that sells some fun, graphic clear stamps, but also sells kits to make your own gifts, sewing patterns and smaller versions of the main gift sets. Check them out! So, now it's your turn to play. Visit our shop for the week, Pegasus Maiden and choose an item to create your inspiration piece on. Make sure to post your creation to Etsy Inspired Challenge Blog by Friday, September 24th at noon! One lucky winner will win the beautiful feathered headpiece and another winner will win two stamps of their choice from Schlosser Designs. Don't forget to also take a look at the beautiful and amazing work of the Etsy Design Team to help inspire you and get crafting! Patterned Paper: (Romance and Ashton from Analee collection) Prima. Clear Stamps: (Flourishes and sentiment from Embellishments set) Papertrey Ink. Dye Ink: (Pixie Dust) Tsukineko. Fibers: (Mint green sheer) Creative Imaginations. Accents: (Crystal stick pins, kraft envelope) Maya Road. (Pearls) Kaiser Craft. (Scalloped Border & flower rub on) Prima. (Lace rub on's) Hambly Screen Art. How perfect, Emily! I love how you got inspired from all the photos that you picked out! 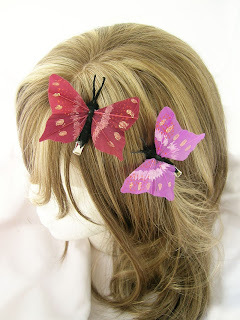 That butterfliy is gorgeous with the dimension and colors! Thanks for the inspiration! Love that big bold butterfly ... wonderful inspired design. what a gorgeous gorgeous piece! Emily, you make me stop and say 'Wow!' 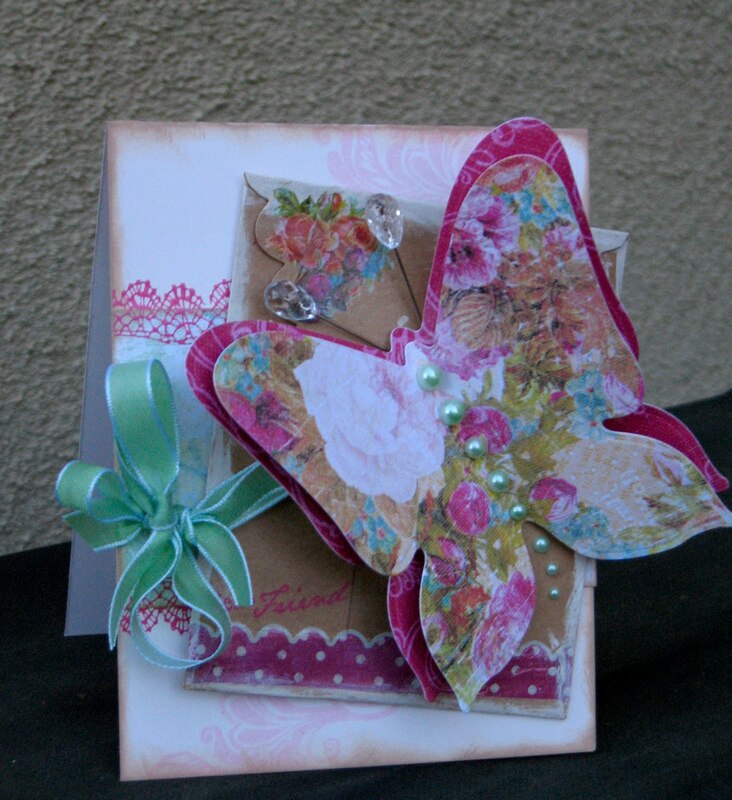 I love everything about this card...such a great layout, pretty colors, and amazing butterfly. I love your big butterfly! That is lovely! The stick pins are fabby too! WOW! This is one awesome and inspiring card. I just love your take on this inspirational piece. OK--this is just too gorgeous! I love that butterfly--so pretty (and two different papers! ACK--beautiful!). I Love those pins!! Great detail with the pearls--and that ribbon....how do you tie bows like that??? SO pretty!! Love the softness but all the details and boldness in that hot pink! LOVE IT! You rock, Emily! I'm so glad we are on the same team--def. inspired by YOU!!! OMG this is sooooooooo beautiful Emily! You always create such beautiful detailed cards!